For Dawn James of Hugs Unlimited, her love of teddy bears seems to have lasted her entire life. "When I was a child, my teddy bears were my favorite toys. I really believed my Dad when he said they used to come alive when I went to sleep." With an early love of sewing, she combined that love with that for her teddy bears and would make outfits for her furry friends. 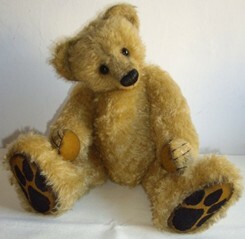 In 1978, while attending classes in toy making at Brighton College, the first of many teddy bears would come alive through Dawn's creative hands. 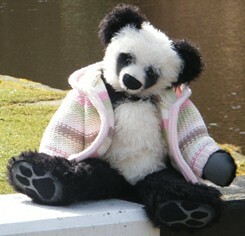 The first bears were ones that she made for fund raisers at various charities. In the early days, she worked for a trade union and was more than happy to make the bears as raffle prizes. It was in 1986 that she set up her company, Hugs Unlimited. "So many people had asked me if they could buy my bears that when the circumstances were right, it seemed like the best thing to do." At that time, she was making toy bears of synthetic plush and she published them in a catalogue and sold them dressed in about 20 different outfits. Several years later, she began experiencing difficulty in complying with the UK and EU toy regulations. "That was the point when I started to look at other materials and made the decision to stop making children's bears and to concentrate on adult collector bears." Although she was a little sad that she was unable to carry on making bears for children, she never looked back, as now she uses all the materials and accessories that she wants to without having to worry about them hurting someone. "One thing I have never grown out of is my love of bears. I adore them and have quite a good collection, including some that I had as a child. 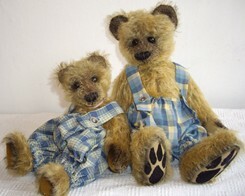 I really like miniature bears and have quite a few of them too. However, what really gets me excited is the feel of the hug that you can only get from a bigger bear. I love just holding a bear and seeing that look of complete love and trust coming from them." That is the look she strives to get in her own bears. 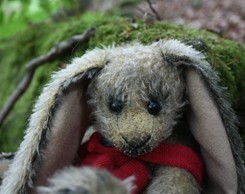 "I don't want to create a bear that will live his/her life in a cabinet behind glass. I want to create something that really means something special to the person that ends up with them; a furry friend that they can pick up and cuddle and tell their troubles to." Dawn also likes to gently age her bears so that they look like they have been around a while because she thinks cuddling a bear is so important. "I will spend a lot of time getting the feel of the bear just right. They have to be tactile and to have that ability to snuggle." She likes to give her bears a sense of fun. 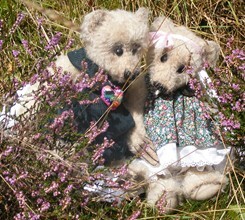 "I love using vintage lace and accessories and some of my bears are quite elaborately dressed." Dawn sells her bears mainly through specialized bear fairs and through her web site. "I prefer to sell my bears in person. That way, collectors can hold them and see how they feel." 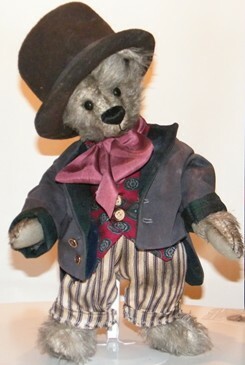 Dawn's 'slouchy' type bears are often difficult to photograph and are much better in person so the collector can appreciate them 'in the fur. "Nothing gives me more pleasure than seeing "adult children" love my bears. In addition to her love for teddy bears, Dawn has a deep love for real bears. After hearing about the World Society for the Protection of Animals (WSPA) Bear Adventure last year, she decided to join in. The WSPA opened a bear sanctuary in Romania to house rescued bears from illegal zoos and tourist attractions. The Bear Adventure is a 50 mile fund-raising trek over and through the Carpathian Mountains in Romania. Even though it was difficult and required a lot of training, between the 20 that participated, they raised enough money for the bears to be looked after for a whole year. 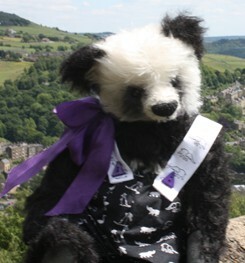 Dawn currently makes her home in West Yorkshire, England with her husband Chris, who is a bear lover too. Since last October, Dawn joined the staff as an editor of the only UK teddy bear magazine, Teddy Bear Times. 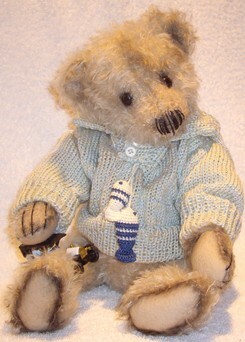 "It's a job I am really enjoying, but I am still making quite a few bears as well." With many artist awards under her belt, she's looking forward to soon celebrating her 25th anniversary of being in business. 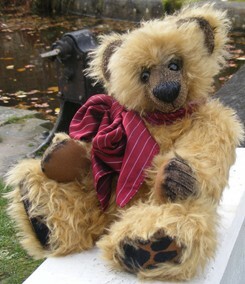 "It never ceases to delight and amaze me that people choose my bears to take home with them. There are so many fabulous artists around these days, that it really does feel very special when someone falls in love with a bear that I have made." It's plain to see, that with Dawn's creativity, the hugs are definitely unlimited. Dawn and her husband hike across mountains to help feed rescued bears. Read . . .